This photo mixes two separate scenes. There's the one outside St. Joseph’s Church in Tacoma, where the bride and maid of honor smile as they chat with Father Jacob, who will be officiating the wedding ceremony that is about to start. 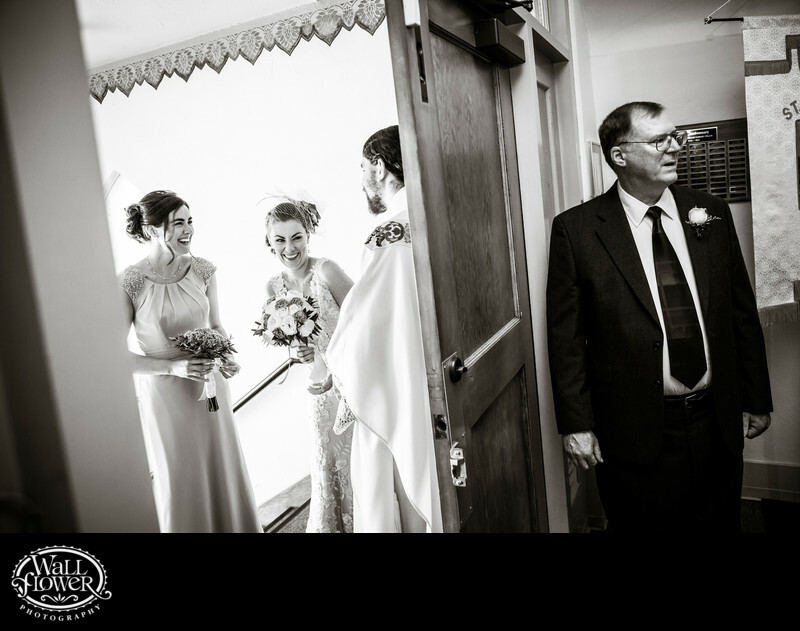 Then there's the scene just inside the front door, where the bride's father waits to walk her down the aisle. Color temperature was very different in the two scenes: deep shade on a sunny day colors everything blue, relative to the warm indoor light of the historic church's foyer. Although the color could be balanced, it would never look quite right, and converting the photo to black and white was an easy and elegant solution to the color temp issue, as always. Plus, it helps you focus on everyone's expressions.